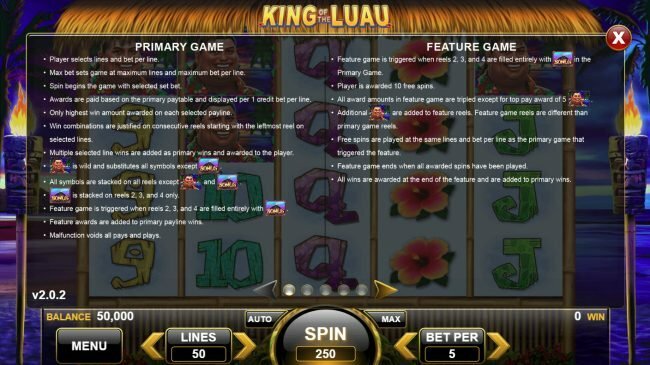 Review of King of the Luau online slot machine produced by Spin Games developers with 50 lines and 5 slot reels. 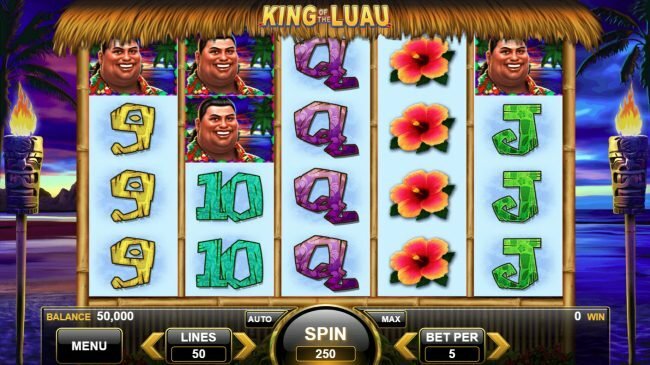 King of the Luau Slots has not been reviewed yet, be the first to rate this slot. 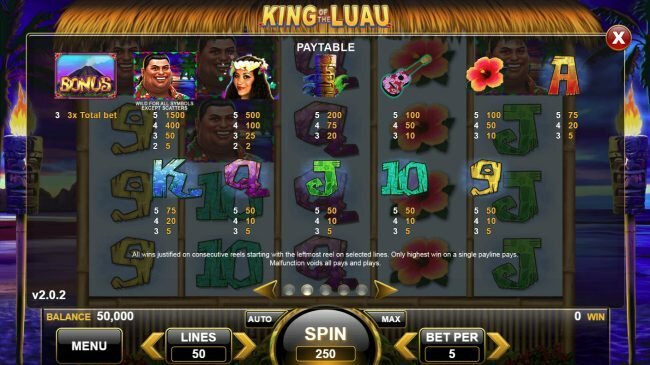 The King of the Luau Slot, an entertaining 50 payline, 5 slot reel slot. 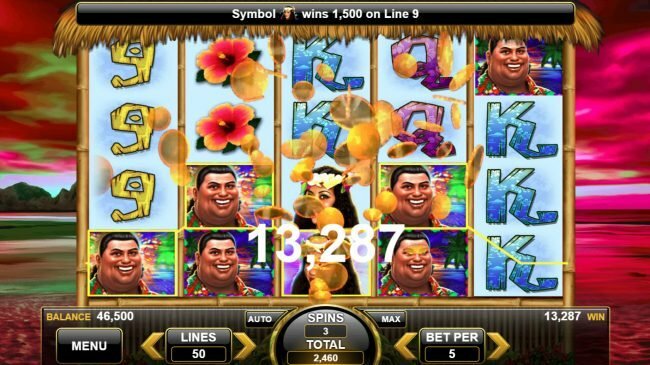 This Hawaii island theme based Slot Machine displays its work in design with hula girl, tiki, guitar and flower, and then King of the Luau drives it through with ace, king, queen, jack, ten and nine wrapping up the complete feel. 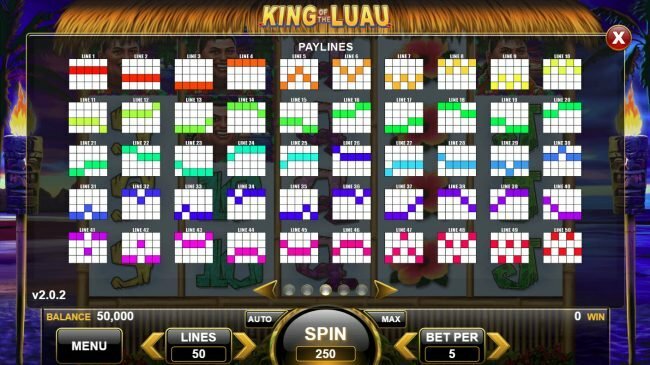 Wagering on King of the Luau is easy, allowing an initial minimum wager of $0.01 up to a max bet of $2.5, this allows you to play at your comfort amount. 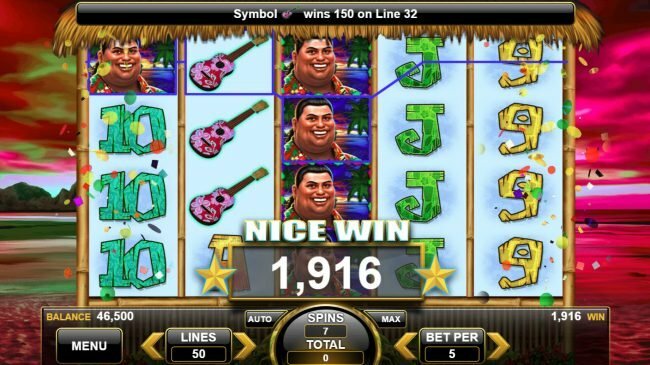 Try to have a few man wild symbols to allow for a large payout on King of the Luau. The scatter icon seen on King of the Luau are a volcano bonus, these scatter pay out when you have them anywhere on the game. These special volcano bonus images do not need to be on the same pay line to activate. It usually is a bad thing when your starting reels don&apos;t match up but there is always an ability of still hitting a scatter win. 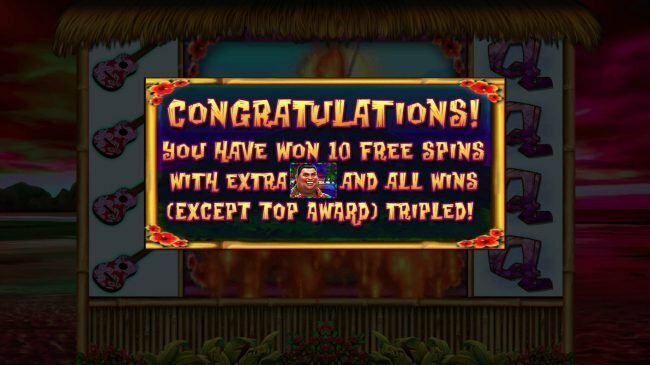 I recommend other online Slots like 25 Diamonds as it has 50 lines also, similar slots including World of Ripley&apos;s Believe It or Not and King of the Luau are enjoyable also. As a lot of Spin Games slots like this one act the same so be sure to find one that entertains you the best. 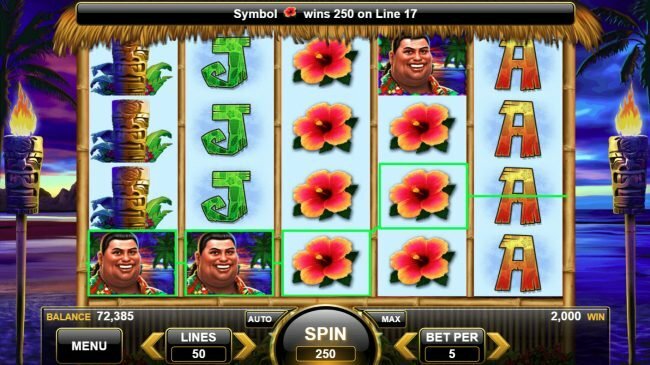 King of the Luau is a lot of fun to play, the Hawaii island theme was well thought out and the slot play is exciting. Some other Online Slot Machines like American Gold Rush share in much of the same game play. All games offer a decent chance of winning a large pot but cash out your winnings before they are gone. 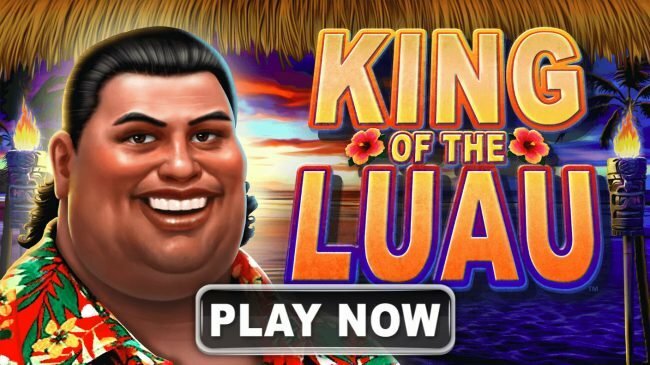 Playing King of the Luau gives you a powerful way to collect large sums of money, to do this get a slot bonus round win. On our video slot write ups I like to finish with the best aspect to look forward to such as these awesome game bonus games. 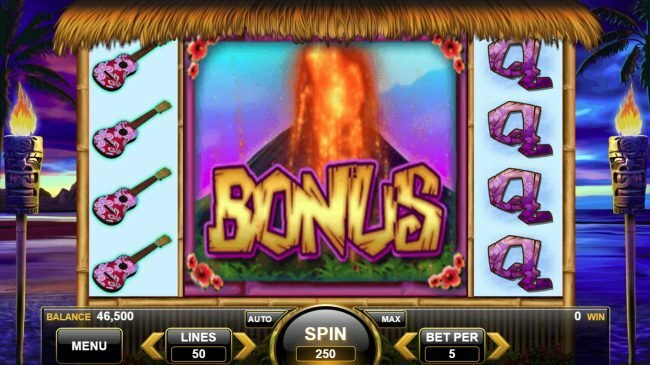 A Free Spins is begun once you achieve three volcano bonus symbols appearing on reels 2, 3 and 4, this bonus game appears to produce very well. I will give King of the Luau 5 of 5 stars for the bonus rounds. 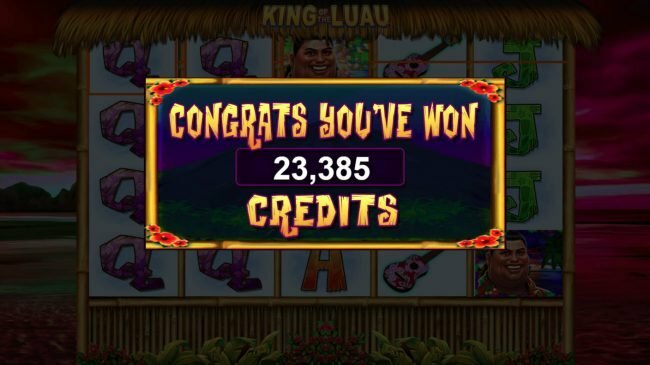 Bonus rounds add so much excitement to modern slot machines, you will find that this is the best feature of King of the Luau.